The new Midwestern Council of Sports Car Clubs website is live just in time to celebrate it’s 60 year anniversary! Please be patient as new content is populated in the coming weeks. Have trouble locating the forums? Under the Members and Friends navigation menu; it’s the second entry. If you’re on a mobile device, click on the ‘hamburger’ menu on the top right of the site (3 horizontal lines) to access the top nav menu. When are the results from July 7th HSAX going to be posted? I haven’t received final results yet, but should have them shortly. Expect them in the next day or so. Does anyone remember a father-son (Hovorka sp?) who raced a 1968 Camaro Z-28 in the late ’60s-80’s. Please contact me at my e-mail. You may want to ask in our forums for a larger audience. Hi Bill – Are you asking about low-speed/parking lot auto-x or our high-speed racetrack auto-x? 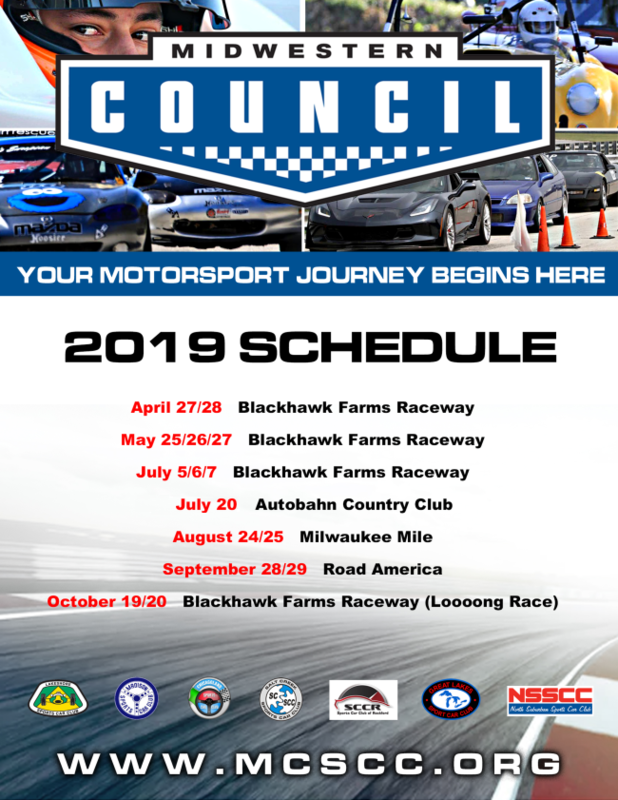 The Rockford and Madison member clubs each run their own low-speed series, but they are not Midwestern Council sanctioned series. MC will continue to sanction the high-speed auto-x series. You can access our preliminary 2019 schedule here. HSAX events should take place at Blackhawk on Memorial Day and July 4th weekends as well as at Milwaukee Mile and Autobahn Country Club. I am looking for information or pictures of a 1970 McLaren M12 Can-Am # 86 likely red in colour Driven by Thomas Phillips at Blackhawk Farms in 1975 and 1976. The car entered 3 races in 1975 twice, did not start a once, won the race. I would appreciate hearing from anyone who may have seen the car or have pictures. If someone knows who built the car and where else it raced, this would be helpful too. Ian Wood Vancouver BC Canada. 778 988 6815 cell anytime. I was HP Champ in 1968, but advancing age has dimmed my memories somewhat. Our team (Green Giant Racing Team of the Great Lakes Sports Car Club) ran two HP A-H (and maybe one in JP) Sprites and an MGB that year, but I can’t remember what class the 1800cc MG ran in. Is there anybody still around who remembers us, or can someone look it up for me? Those were the days: Blackhawk Farms, the Fair Park in West Allis–and my memory quits there. Was Linndale Farms still running? Where else did we compete? Hi Dean – I’ll contact you via email.